- and the signed, limited edition print was won by Laura Moynes. 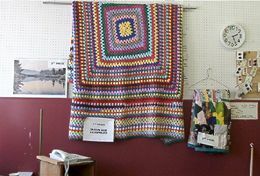 Community Care thanks all those who purchased tickets in support of our programs to help seniors stay living at home. 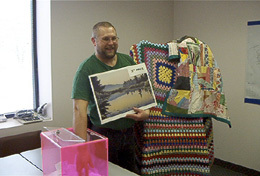 Community Care is holding a raffle to be drawn on March 31, 2003. - third prize is a signed, limited edition print. Tickets are $1 each or 3 for $2.00 and you can get them at the Community Care office in The Armoury, 206 Main Street, Picton or in the Thrift Shop at 281 Main Street, Picton. Licence number 346178. 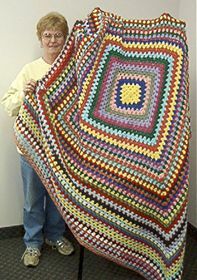 Marilyn Dean is shown with the bedspread she crocheted and donated to Community Care's raffle.